(Nanowerk News) Employing an ingenious microfluidic design that combines chemical and mechanical properties, a team of Harvard scientists has demonstrated a new way of detecting and extracting biomolecules from fluid mixtures. The approach requires fewer steps, uses less energy, and achieves better performance than several techniques currently in use and could lead to better technologies for medical diagnostics and chemical purification. The biomolecule sorting technique was developed in the laboratory of Joanna Aizenberg, Amy Smith Berylson Professor of Materials Science at Harvard School of Engineering and Applied Sciences (SEAS) and Professor in the Department of Chemistry and Chemical Biology. Aizenberg is also co-director of the Kavli Institute for Bionano Science and Technology and a core faculty member at Harvard's Wyss Institute for Biologically Inspired Engineering, leading the Adaptive Materials Technologies platform there. 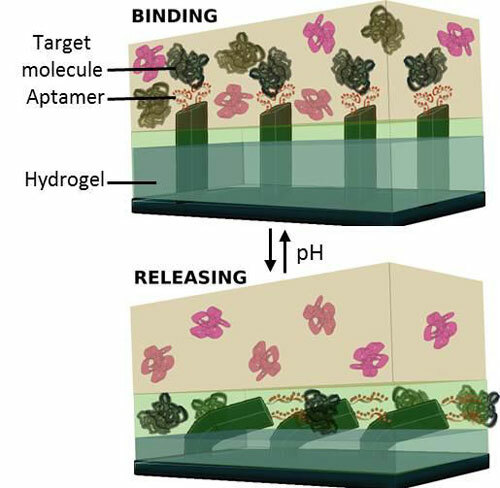 The new microfluidic device, described in a paper appearing today in the journal ("An aptamer-functionalized chemomechanically modulated biomolecule catch-and-release system"), is composed of microscopic "fins" embedded in a hydrogel that is able to respond to different stimuli, such as temperature, pH, and light. Special DNA strands called aptamers, that under the right conditions bind to a specific target molecule, are attached to the fins, which move the cargo between two chemically distinct environments. Modulating the pH levels of the solutions in those environments triggers the aptamers to "catch" or "release" the target biomolecule. After using computer simulations to test their novel approach, in collaboration with Prof. Anna C. Balazs from the University of Pittsburgh, Aizenberg's team conducted proof-of-concept experiments in which they successfully separated thrombin, an enzyme in blood plasma that causes the clotting of blood, from several mixtures of proteins. Their research suggests that the technique could be applicable to other biomolecules, or used to determine chemical purity and other characteristics in inorganic and synthetic chemistry. "Our adaptive hybrid sorting system presents an efficient chemo-mechanical transductor, capable of highly selective separation of a target species from a complex mixture--all without destructive chemical modifications and high-energy inputs," Aizenberg said. "This new approach holds promise for the next-generation, energy-efficient separation and purification technologies and medical diagnostics." "The system allows repeated processing of a single input solution, which enables multiple recycling and a high rate of capture of the target molecules," said lead author Ximin He, Assistant Professor of Materials Science and Engineering at Arizona State University and formerly a postdoctoral research fellow in Aizenberg's group at Harvard. Conventional biomolecule sorting systems rely on external electric fields, infrared radiation, and magnetic fields, and often require chemical modifications of the biomolecules of interest. That means setups can be used only once or require a series of sequential steps. In contrast, said Ankita Shastri, a graduate student in Chemistry and Chemical Biology at Harvard and a member of Aizenberg's group, the new catch-transport-and-release system "is more efficient--requiring minimal steps and less energy, and effective--achieving recovery of almost all of the target biomolecule through its continuous reusability." The authors say that the system could provide a means of removing contaminants from water--and even be tailored to enable energy-efficient desalination of seawater. It could also be used to capture valuable minerals from fluid mixtures.